Seniors who want to stay in their own small house to the end of their life must pick one that serves their needs into advanced age. Seniors must also consider, but not expect, the possibility of certain age-related issues as they get up there in years. Although those who choose a small house would also likely be smart about healthy eating and getting enough exercise, seniors must plan for all future possibilities. They need a house that fits those requirements so that they are not forced to move just because the house isn’t designed for them. There should be no obvious “old folks” features in the house, however. The design should take a creative, cutting-edge, and subtle approach to fulfilling the needs of seniors. This means that although there will be many features that meet the requirements of seniors at any age they will be undetectable! There are plenty of so-called small house communities for seniors, but most of them are priced out of reach for many people. The majority of these detached houses are more than 1,000 square feet, which is part of the reason they are so expensive. Those that are near 1,000 square feet and less expensive are usually attached. So seniors are forced to live in a condominium or an apartment that doesn’t give them much privacy, relief from noise, and in many cases, their dignity. The solution as I see it is to build detached small houses for seniors in the 400-900 square foot range. The low-end would be a studio house. A studio house is an open floor plan with no bedrooms. With some creativity and innovation, a studio house can be very attractive and comfortable. 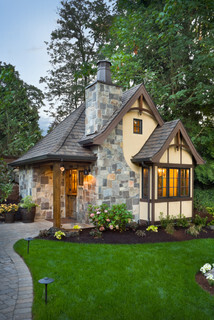 Some seniors who read this will instantly reject the idea of living in such a small house. That reaction may come from the conditioning we have all received through home builder advertising and movies that depict how big a house should be. If you ignore those images of the so-called perfect home and open your mind to the idea of downsizing to a much smaller house you will be able to see how doing this can up-size your lifestyle! Another way to think of it is to consider the amount of space in your home you use on a daily basis and how much of it is used to just store your accumulated possessions. 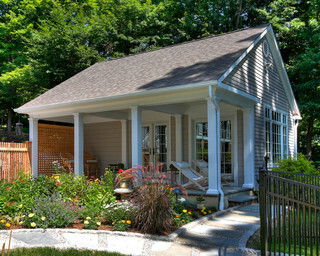 Given the choice between a condominium or apartment and a detached small house, wouldn’t you rather live in the latter? And if you’ve downsized by selling your “stuff” and reduced your expenses accordingly, you’ll be able to invest more in making your small house really nice! You may be thinking, “If I live in a studio style or one bedroom house there will not be a guest room for my grandchildren and friends.” If you think about it, most guest rooms are empty 99% of the time. Take your grandchildren on some adventures instead! You’ll both gain more from those experiences. And let your friends stay in a hotel. You’ll both be more comfortable. The final hurdle may be the issue of not having enough space for family events. Since you won’t have the space to host these functions in your small house (the perfect excuse 😀 ), you could let younger family members pick up the ball or hold them in a park, community facility, or restaurant. Here are the criteria for what needs to be included in small houses for seniors. Single level construction. No second floors, lofts, split-levels, or steps. Doors that are wheelchair accessible (but don’t look that way). Distinctive bed area with visibility to great room television if studio house. Spacious bathroom with walk-in (no step) oversize shower with seat and imperceptible handles. Kitchen with “senior” size (as opposed to family size) appliances. Laundry room with folding counter, hanger rod, and hideaway ironing board. Abundant easy access ground level storage. Small low-maintenance yard (no grass) with patio. That’s how I see it. Who will be the courageous and humanistic home builder who leads the way?